Who's Afraid of Virginia Woolf? 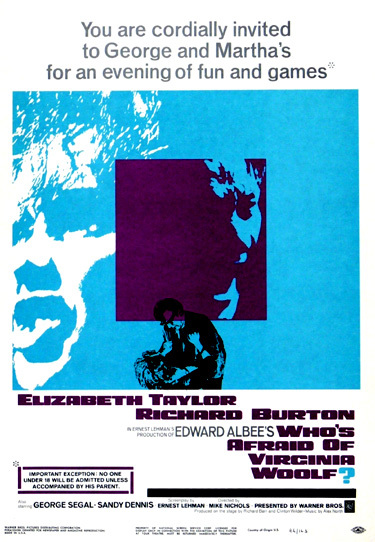 (1966), a famous and shocking black comedy, was based on Edward Albee's scandalous play (Ernest Lehman's screenplay left the dialogue of the play virtually intact). It was first performed in New York in October of 1962, and it captured the New York Drama Critics Circle Award and the Tony Award for the 1962-63 season. The film's title refers to Virginia Woolf (1882-1941), an influential British feminist writer who pioneered the 'stream of consciousness' literary style while examining the psychological and emotional motives of her characters. [Note: Perhaps the 'fear' of VW refers to the film's characters who are suffering marital discord in the emotionally-draining film, and who may have 'known' that she suffered from mental illness and ultimately went insane and committed suicide.] The title is also a parody of Who's Afraid of the Big Bad Wolf?, a tune sung in Disney's Three Little Pigs (1933) animated short film. The names of the two major characters, George and Martha, are those of the first US President and his wealthy wife - a marriage of convenience. "Walpurgisnacht (Night of the Witches)"
The shocking content - the dramatic portrayal of the destructive, sado-masochistic, and cruel battles in one couple's tempestuous, love-hate relationship during a late night (2 am) to dawn brawling encounter while victimizing another young couple - was thought to be too vitriolic, frank, explicitly blasphemous and foul-mouthed for the film screen. [Note: It was the first American film to use the expletive 'goddamn' and 'bugger'.] The MPAA ratings board gave the film a seal of approval after Warner Bros. appealed and made a few cuts of the most extreme profanity (such as "Screw you"). It was the first film to be released with a "Suggested for Mature Audiences" warning. The black-and-white film, masterfully directed by Mike Nichols (in his directorial screen debut), captured probably the greatest performance ever of Elizabeth Taylor's career (she won her second Academy Award as well as Best Actress praises from the New York Film Critics, the Nat'l Board of Review and the British Film Academy). Woolf won five Academy Awards from its thirteen nominations: Best Actress (Elizabeth Taylor), Best Supporting Actress (Sandy Dennis), Best B/W Cinematography (Haskell Wexler), Best Art Direction and Best Costume Design. The other eight nominations included Best Picture, Best Actor (Richard Burton), Best Supporting Actor (George Segal), Best Director (Mike Nichols), Best Screenplay (Ernest Lehman), Best Sound, Best Original Music Score, and Best Film Editing. [Note: It was the first film to have every credited member of its cast receive an acting nomination. Since Cimarron (1931), it was also the first in Academy history to be nominated in every eligible category.] As compensation for his defeat this year, director Mike Nichols won the Best Director Oscar the next year for The Graduate (1967) over Norman Jewison, the director of the Best Picture victor In the Heat of the Night (1967). In the sloppy kitchen in a famous sequence in which she munches on a fried chicken leg and puffs on a cigarette, she repeatedly - with a deep whiskey voice - berates her husband for not remembering the film the line is from: "What's it from, for Christ's sake?...some damn Bette Davis picture, some god-damned Warner Bros epic." Exasperated at her criticism of his cocktail-party behavior, he inquires: "Do you want me to go around braying at everyone all night the way you do?" They have returned at two o'clock early on a Sunday morning from one of her father's "goddamn Saturday night orgies," according to George. As they bicker at each other, it is revealed that George is a tired, defeated teacher, married for twenty years to the daughter of the president of the college. When she suggests that they have a drink, he finds out that they've "got guests coming over" that Martha invited to join them in an 'after-party' party - a blonde, good-looking, young newly-appointed Math Department member [Martha is mistaken - he is an assistant professor in the Biology Department] and his wife, described as "a mousey little type, without any hips or anything." Poor Georgie-Porgie, put-upon pie...Awwwwwwwwwww! Hey! Hey! Hey! (She sings) Who's afraid of Virginia Woolf, Virginia Woolf, Virginia Woolf, Who's afraid of Virginia Woolf...Ha, ha, ha, HA! (No reaction) What's the matter? Didn't you think that was funny? I thought it was a scream...You laughed your head off when you heard it at the party. George: Just don't start in on the bit about the kid, that's all. Martha: What do you take me for? Martha: Yeah? Well I'll start in on the kid if I want to. Martha: Just leave the kid out of this. George: I'd advise against it, Martha. As she explodes and yells "GODDAMN YOU!" at him, he flings open the door and there stand their younger invited guests arriving for a nightcap. Feeling immediately ill at ease in a socially awkward and uneasy situation are the 26 year old plain blonde Honey (Sandy Dennis) and her husband, a 28 year old professor Nick (George Segal). George is pleased with himself that they have unceremoniously heard Martha's hostile remark - coming from a "subhuman monster yowling at 'em from inside." Too polite and naive to have refused the party invitation in the first place, Nick and Honey suddenly find themselves pawn-like in the middle of an intellectual, argumentative warzone in a most unusual evening resembling an endurance test. After Nick comments on an abstract painting in the living room, George explains that it is "a pictorial representation of the order of Martha's mind." Honey is already a bit tipsy from the earlier party and orders more brandy: "Never mix-never worry." The first indication that Martha is lewdly flirting with Nick, one tactic in her arsenal of weapons against her ineffectual husband, comes when she rubs her hand on his knee, telling him that her "Daddy knows how to run things" at the college. Martha, will you show her where we keep the...eh, euphemism? What? Oh...yes. Ever since I married, uh, What's-her-name...ah, Martha. Even before that. (Pause) Forever. (To himself) Dashed hopes, and good intentions. Good, better, best, bested. (To Nick) How do you like that for a declension, young man? Eh? All right, what do you want me to say? Do you want me to say it's funny, so you can contradict me and say it's sad? Or do you want me to say it's sad so you can turn around and say no, it's funny. You can play that damn little game any way you want to, you know? Martha and I are having...nothing. Martha and I are merely exercising... that's all, we're merely walking what's left of our wits. Don't pay any attention to it. Well, you'll get over that - small college and all. Musical beds is the faculty sport around here. George notes that Nick's wife is "slim-hipped," but learns that they don't have kids yet: "We want to wait a little, until we're settled." George is distrustful when the two women are gone for awhile and ponders: "Damn it! I wonder what women talk about when the men are talking. I must find out sometime." As Honey descends the stairs, she listens, reacting fearfully when George is asking Nick how many kids they plan to have. When Honey joins their company again from upstairs where Martha has been changing her clothes, she tells George in a bright voice: "I didn't know that you had a son...A son. I hadn't known...Tomorow is his birthday. He will be sixteen." George wheels around after the second oblique reference to their son, asking: "She told you about him?" Then, he turns and glares upstairs, angry that she has violated their life-long pledge of discretion by revealing their make-believe procreation of a fantasy child, an imaginary son, that they could never have: "OK, Martha, OK....Damn destructive." (The child was created for self-protection, as a scapegoat, and to provide a common meeting ground for the warring couple.) When Nick and Honey nervously say they have to go home, George harshly barks (a subtle and nasty insult showing his incisive insight into the younger couple's marital problems and lack of children themselves): "For what? You keeping the babysitter up or something?" George is bogged down in the History Department. He's an old bog in the History Department, that's what George is. A bog...A fen...A G.D. swamp. Ha, ha, ha, ha, A Swamp. Hey, swamp. Hey, SWAMPY! Learning that Nick was both a quarterback and a former intercollegiate state middleweight boxing champion, Martha makes lascivious, obscene advances toward the attractive young man. She taunts him: "You still look like you have a pretty good body now, too, is that right? Have you?...Is that right? Have you kept your body?" Even Honey naively encourages her observations about his studly body: "Yes, he has a very firm body." Martha describes how her own "paunchy" husband doesn't like "body talk. 'Paunchy' here isn't too happy when the conversation moves to muscle." One of the most dramatic, riveting moments of the film blurs fantasy and reality. Martha brings up another embarrassing wound from the past, questioning George's manliness. She describes a public boxing match incident which her Daddy orchestrated in his back yard. When George told his father-in-law that he didn't want to box, Martha got into the pair of gloves herself and punched George POW right in the jaw, sending him crashing into a huckleberry bush. During her story telling, George finds a shotgun in another room, stalks his prey, and takes aim at the back of Martha's head. When Honey notices the gun, she screams in fright. Martha turns her head to face him as he pulls the trigger - out blossoms a brightly-striped umbrella, a symbolic display of his weakness and sexual impotency in another of his games. He adds sound effects: "Pow. You're dead!" They laugh, mostly from relief and confusion. Honey (giggling and drunk): When is...where is your son coming home? George: Ohhh. Martha? When is our son coming home? George: No, no. I want to know. You brought it out into the open. When is he coming home, Martha? Martha: I said never mind. I'm sorry I brought it up. George: Him up...not it. You brought him up. Well, more or less. When's the little bugger going to appear? I mean, isn't tomorrow meant to be his birthday or something? Martha: I don't want to talk about it. George: I'll bet you don't. (To Honey and Nick) Martha does not want to talk about it...him. Martha is, uh, sorry she brought it up...him. Honey (idiotically giggling): When's the little bugger coming home? George: Yes, Martha...now that you've had the bad taste to bring the matter up in the first place...when is the little bugger coming home? Martha: George's biggest problem about the little...about our son, about our great big son, is that deep down in the private-most pit of his gut, he's not completely sure that it's his own kid. George: My God, you're a wicked woman. Martha: And I've told you a million times, baby...I wouldn't conceive with anyone else, you know that baby. George: A deeply wicked person. George: He has blue eyes, Martha. George: You've already sprung a leak about you-know-what...about the sprout, the little bugger, our son. If you start in on this other business, Martha, I warn you. Martha: I stand warned...So anyway, I married to S.O.B. I had it all planned out. First, he'd take over the History Department. Then when Daddy retired, he'd take over the whole college, you know? That was the way it was supposed to be....Until he watched for a couple of years and started thinking that maybe it wasn't such a good idea after all, that maybe Georgie-boy didn't have the stuff, that maybe he didn't have it in him!...You see, George didn't have much push, he wasn't particularly aggressive. In fact, he was sort of a FLOP! A great big, fat, FLOP! Go on Martha, go on. Martha. Don't Martha, don't. All right, all right. (Singing) Who's afraid of Virginia Woolf, Virginia Woolf, Virginia Woolf. Who's afraid of Virginia Woolf, so early in the morning.